Sky Guide's timeline controls let you speed forward and backwards through the stars. I grew up in Los Angeles, a city not so much famous for its stargazing as it was for its murky purple night haze. But in the summer, my family would drive up to the mountains above Lake Tahoe and stay at our cabin for a few weeks. Free from light pollution and smoggy skies, it was there I learned to love the stars. Years later, I’ve forgotten much of what my father taught me about constellations and moonrises, but I still take pleasure in stargazing. Sky Guide, a $2 app from Fifth Star Labs, is the perfect replacement for my lack of expertise: It’s a beautifully constructed app that helps you find the stars, satellites, planets, and constellations above your head. At its most basic, Sky Guide uses your device’s compass and other sensors to orient the stars on your screen with the stars above you in the sky. 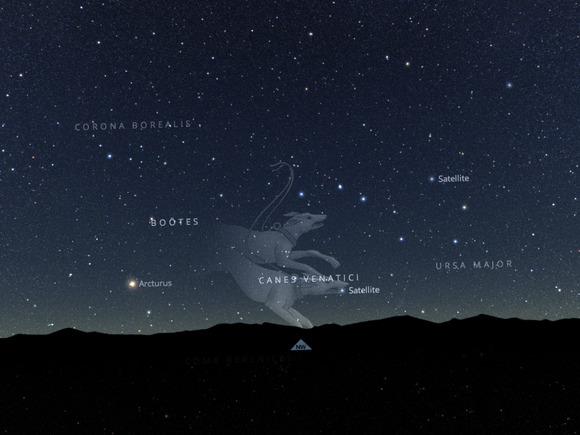 You can turn the compass off to pan around the app’s stunning high-definition 360-degree rendering of the sky, including a quick look under the horizon at the stars not yet visible in your area. By default, Sky Guide presents the cosmos at its most dense, with nebulae and star clusters in full view; you can dampen the brightness of those stars with a two-finger swipe downward, however, so that it more clearly represents the night sky in your area. You can also zoom in with a pinch to see objects more clearly, and tap a star, satellite, cluster, or planet to learn more about it. Select the celestial object you're looking for, and Sky Guide will automatically point to it. But you don’t have to know where your favorite constellations are to find them in the night sky: Sky Guide’s search lets you type in what you’re looking for and then uses a white arrow to guide you to its correct location. The search field also offers a list of constellations that are setting or rising soon, and notes which constellations aren’t visible in either the northern or the southern hemisphere. My favorite part of Sky Guide, though, is its historical data: based on your location (automatic or manual), the app provides approximate star charts for any day in history. The app’s calendar goes back to the year 1 A.D., though there are more recent events you can follow (such as the path of comet Hale-Bopp or more recent comet ISON). Not only are the visuals a fun trip through space and time, but at high speeds, the timelapse really lets you see the rotation of the universe and all its glories. The app’s made such an impression that I’ll sometimes use it even when I’m not outside. It makes a particularly good companion on your iPad during cloudy nights, when you want to remember that there are celestial bodies hovering above. In short, if you’re at all interested in planets, stars, or satellites, you want this app. It’s informative without being cluttered and beautiful without sacrificing content. And it brings us just a little big closer to the skies above. Sky Guide, a $2 app from Fifth Star Labs, is the perfect companion for helping you find the stars, satellites, planets and constellations above your head.